Electric car from the Chicago Electric Motor Car Co in 1914. Homepage. This page: Correspondence from 1914 relating to the possible sale of American-made electric motor-cars in England. Chicago Electric Motor Car Company. Electric cars are not a new invention, as witnessed by this letter dating to 1914 sent from the offices of the Chicago Electric Motor Car Company to a potential vendor for their electric automobiles in London, A.H. Bailey and Co. Alfred H. Bailey, of Southampton Row, High Holborn, had either been in touch with the Chicago concern regarding the possible supply of Chicago Electric motor vehicles to a UK audience, or else the American company were simply following up an earlier communication. 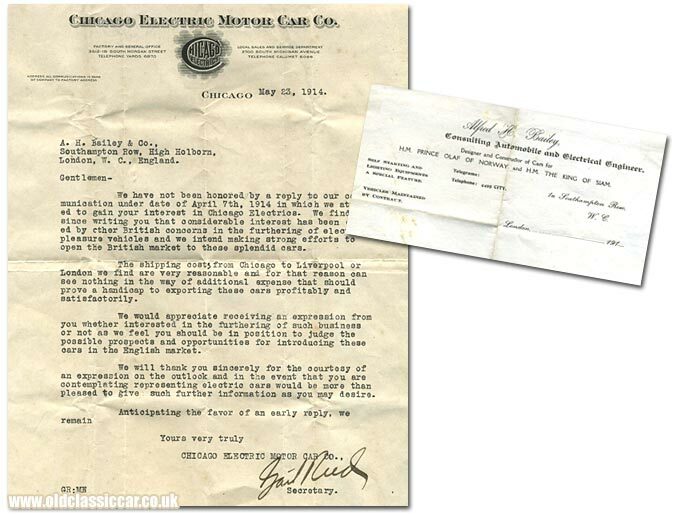 We have not been honored by a reply to our communication under date of April 7th, 1914 in which we attempted to gain your interest in Chicago Electrics. We find since writing [to] you that considerable interest has been evinced by other British concerns in the furthering of electric pleasure vehicles and we intend making strong efforts to open the British market to these splendid cars. The shipping costs from Chicago to Liverpool or London we find are very reasonable and for that reason can see nothing in the way of additional expense that should prove a handicap to exporting these cars profitably and satisfactorily. We would appreciate receiving an expression from you whether interested in furthering of such business or not as we feel you should be in a position to judge the possible prospects and opportunities for introducing these cars in the English market. We will thank you sincerely for the courtesy of an expression on the outlook and in the event that you are contemplating representing electric cars would be more than pleased to give such information as you may desire. CHICAGO ELECTRIC MOTOR CAR CO.
Did Alfred H. Bailey ever take up the option of marketing these electric cars in the UK, or at least look into the matter further I wonder? Alfred H. Bailey - Consulting Automobile and Electrical Engineer. Included with the letter from Chicago Electric was a slip belonging to the receiver of the letter, Mr A. H. Bailey. This slip confirms that he was an electrical engineer, in addition to being a freelance automobile consultant - as confirmed by a note on this paper: "Designer and Contructor of Cars for H. M. Prince Olaf of Norway and H. M. The King of Siam. Olaf V was born in 1903. A copy of Popular Mechanics magazine for April 1913 includes an article about Prince Olaf, and his new "baby" automobile, a gift from Queen Alexandra his grandmother, and wife of Edward VII. This toy car, capable of 7 mph, was an electrically-powered, scaled-down, version of a contemporary Cadillac touring car. This, and two other similar cars, was commissioned by London Cadillac dealer Fred Bennett in 1912 as a promotional tool. The job of designing and building the miniature cars was passed to Lockwood & Co of Islington, with the first car making its debut at the 1913 Paris Motor Show. Queen Alexandra saw the car during a demonstration in London, and purchase it for £62 as a gift for Prince Olaf. Could this be the "car" that Alfred Bailey, as a consultant automobile and electrical engineer, had a hand in the design and build of I wonder, working at Lockwood and Co. in North London? In later years Olaf would be an enthusiastic motorist in his own right and preferred to drive, rather than be driven, in the Royal motor-cars. The King of Siam seems to have enjoyed motoring also, with various fine makes and models of car to his name. Interestingly one of these was an electric vehicle, an example of the Electric Victoria Car.